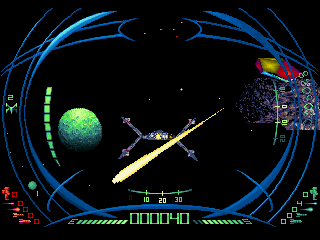 Darxide is a shoot-em-up that was only released in Europe. It consists of ten levels (each featuring a four minute time limit) and your mission is to stop the alien attack force from destroying the Darxide star system. Buttons A and C control your throttle, B fires your laser, and Z launches a bomb (from Level 5 onwards). The first thing to note is the excellent texture mapping and shadow effects that could easily be mistaken for an early PS1 title! Gameplay wise, shooting down large boulders that break off into smaller pieces resembles Asteroids (1979, Arcades); however, some missions have a hint of Defender (1981, Arcades) where you're tasked with saving miners. It's fun multitasking and the decision to either destroy a firing alien craft, hunt down stray boulders, or save a suffocating miner is strategically enjoyable. Despite the cursor being a little too fast for my liking, the controls are solid and choosing to either zoom around the playfield or pick off targets from a prone position feels tight and responsive. There is a small amount of auto-aim which is ideal for counteracting the minor cursor issues, allowing you to easily despatch fast moving craft in an instant. The draw distance is limited though, and while it's understandable given the 32X's hardware limitations, it is annoying when a target appears for a very brief moment before disappearing. Compounding this problem further is the overly strict time limit, as even the opening level is brutal. What also doesn't help matters is the confusing map indicator which has zero differentiation from the main playfield. To top things off, the difficulty settings don't appear to do anything and extra lives are in very short supply. Darxide shows all the makings of a second generation Sega 32X title, but even the varied missions and tight controls can't hide the severe flaws that unacceptably mar the gameplay experience. The time limit is the main offender and without real difficulty options you're left to slog through the same levels ad nauseam. Random trivia: A reworked version of the game called Darxide EMP was released on mobile platforms in 2003.